This is a great dish that is perfect for cold weather. 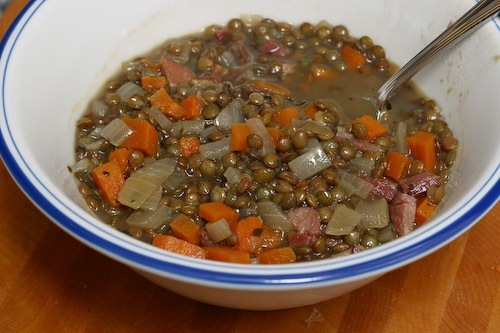 Country ham provides a ton of flavor and the lentils help this dish stick to your ribs. Country ham is similar to prosciutto; it is a ham that is salted, then washed and hung to age. It may not be as delicate or nuanced as prosciutto, but it is also not as expensive, so there is no guilt over throwing some into a soup or stew. You can increase the amount of liquid if you want something closer to a soup. Sweating the lentils when you saute the onions helps keep them together, maintaining their structure and appearance. Heat a dutch oven over medium heat. Once it is hot, add the ham and cook for 2 minutes on each side until brown. Add the onions, lentils and carrots and saute them until the onions become tender, maybe 5 minutes or so. Add everything else into the pot and bring to a boil. 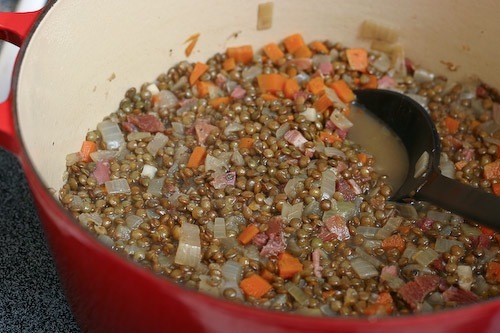 Reduce the heat and cover, simmering for 30-40 minutes until the lentils are tender. Fish out the bay leaves. 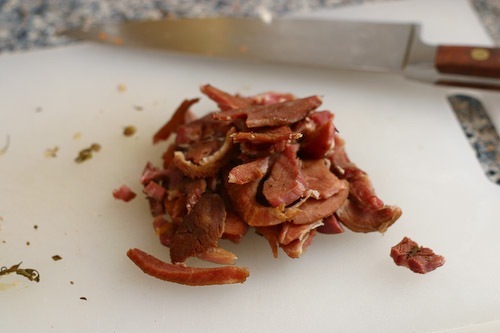 Remove the ham, and cut away the fat, gristle and bones. Dice the ham and return it to the pot. Recipe Update: Not sure why we didn’t add celery to this recipe when we first made it, but since celery, carrots and onions are the “trifecta” – by all means, add celery! I donâ? ?t know on how I stumbled upon this cooking blog., All I know is that Iâ? ?d better check out the archives for a good read. Ha-ha! Just droppinâ?? to say hi! D’oh! Ivy you are right, I completely left that out. It should be 1 cup of lentils. I used French Lentils which are small and have a dark green color. I will update the recipe. How much lentils are in this? I don’t see it listed on the recipe ingredients. And how many does this serve? I picked up a vacuum pack at the Safeway near me. I think it was only $3.75 a pound or something like that. Definitely a bargain! Where’d you buy your country ham?